The Cruciate ligaments are the most commonly injured ligaments in dogs, as they take a great deal of strain on a day to day basis. With modern dogs being either overweight, or bred to be extremely active, the ligaments can snap, resulting in a lameness that comes on suddenly and doesn’t go away on its own. WHAT ARE THE CRUCIATE LIGAMENTS ? 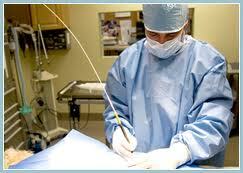 The cruciate ligaments are found in the hind legs of dogs, cats and people. 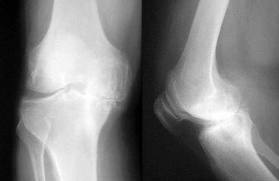 They are two ligaments that cross over, in an x shape, inside the knee or stifle joint. They lie between the underside of the femur (thigh bone) and the top of the tibia (calf bone). There are two per joint. The one lies in the front of the joint (cranial cruciate ligament), and the other at the back of the joint (caudal cruciate ligament.) As the leg flexes and extends as the dog is running or walking, the one will tense and the other relax. In this way they prevent the bottom bone wobbling as opposed to the top bone and stabilize the whole joint when weight is placed on the leg. WHEN DO THESE LIGAMENTS GET INJURED? There are two distinct groups of dogs that tend to tear or injure their cruciate ligaments. 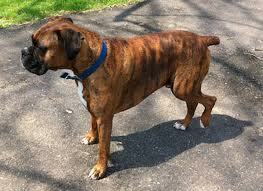 The first group is the large, very active, well muscled breeds such as Boxer Dogs and Staffordshire Bull Terriers. These extremely active dogs put a lot of strain on their cruciate ligaments as they charge up and down in their yards and can tear them fully or partially tear them (often seen in Staffies), leading to a sudden onset of lameness on the hind leg. The second group is middle aged, overweight small to medium breed dogs, such as terriers, Shelties and Maltese Poodles. Years of stretching and overwork of these ligaments in overweight dogs, very often from putting their knees through a lot of strain by jumping on and off of furniture at home and not doing a lot of other exercise, weakens the ligaments over time until one day, they tear. WHAT ARE THE SIGNS OF AN INJURED OR TORN CRUCIATE LIGAMENT? If both cruciate ligaments tear at the same time, the dog may appear to be paralyzed in the back legs. If left unattended, the dog will show lameness on and off for 6 months to a year and will eventually walk on the leg, but with a damaged, arthritic joint. Your vet should recommend X rays (radiographs) of the leg. With these X rays, your vet will check for arthritic changes in the joints, increased joint space from accumulation of fluid and measure the angle of the femur as it sits on the top of the tibia. These will all help to determine if your dog needs surgery, and which type of surgery is best for your pet. WHEN DOES MY PET NEED SURGERY? WHICH PETS ARE NOT CANDIDATES FOR SURGERY? WHAT TYPE OF SURGERY IS BEST FOR MY PET? 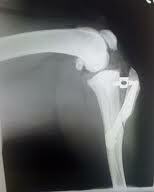 There are dozens of ways that cruciate ligaments have been repaired over the past couple of decades. Some work well, some don’t and some suit different sizes of pets better than others. Very popular in the eighties and nineties and one of the easier types of surgeries to do, a strip of muscle sheath (connective tissue) is taken from the side of the thigh, and brought down to the level of the knee joint. 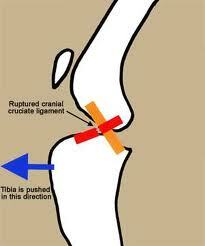 It is then either wrapped around or through the joint to stabilize it. A strip of fascia from the outside of the thigh can never have the same strength as a cruciate ligament and if used, should only be used in very small pets. If used in medium to large breed dogs, especially if overweight, it simply doesn’t work very well. 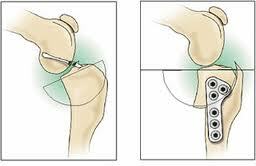 The joint should always be opened to check for meniscial tears and pieces removed, regardless of whether the joint is stabilized internally or externally. Nylon or multiflament suture material is placed behind the fabellae (small bones behind the knee joint on the femur) and tied down through a hole drilled into the top of the tibia. Wire is not as popular anymore as the newer implant materials available are superior. Can be used only if the joint is at a healthy, normal angle for the implant to work. Angles should be measured on X rays before undertaking this type of surgery only to find that the implant breaks because the joint lies at such an angle that excessive forces are operating on the implant. Any implant has the potential to cause a reaction or to fail although this is far less likely with this procedure than with the above mentioned procedures. 6 Responses to "Cruciate Ligament Injuries in Dogs"
Like Jess mentioned above, I also opted for the conservative treatment method when my dog tore her ACL at 10 year olds. I didn’t want to put her under the stress of an invasive procedure especially at her age and size. I met with several vets to put my mind at ease that going down this route was feasible and could actually work. We also got a dog knee brace from Ortocanis online that was flexible enough to be worn every day and not completely restrictive, but provided support at the same time. http://www.ortocanis.com/en/technical-helps-for-dogs/90-knee-brace.html. Keeping my dog immobile to the greatest extent possible for 8+ weeks was a challenge, but it was worth it in the end. More people need to be made aware of this alternative to surgery for this common injury. This was helpful, however we went through the surgery on our border terrier’s left leg in 2009. Now it is her right rear leg and she is 13 years old. We would like to correct with something non-evasive such as a brace. Can you help? Conservative management is also a valid option for certain dogs. Our 12 year old dog wasn’t a good candidate for surgery, so we bought a surgery-alternative brace from WoundWear. We are very happy with it and I don’t think conservative management should be so quickly dismissed.